With our Endless Pools, the coach can be right beside you or your little one to provide immediate, real-time feedback and corrections. We love our Endless Pools at the Swim Studio because they give our coaches so many advantages and tools that we simply don’t have when we go to larger, conventional pools. Because it’s easy to focus on the actual 15’ x 15’ size of the pools—and none of the advantages—we wanted to take a minute to help you see why using resistance pools makes us the most effective swimming coaching staff in Chicago. The smaller pools reduce anxiety for fearful swimmers. The warmer water keeps swimmers cozy as they blow their first bubbles or take their first strokes. The benches and grab bars around the pool give children a place to stand and hold onto before and after their swimming activities. This reduces stress and makes it easier to teach stopping and starting swims. 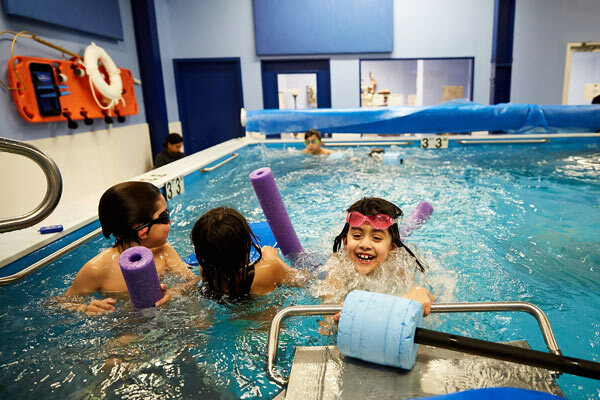 The smaller, above-ground pools isolate the classes more than larger pools do, so kids are not distracted by unrelated activities around the facility. The sound treatments on the walls also reduce noise and echoing that can distract or irritate young children. The smaller distances make for a visually doable swim for new swimmers and gives them the confidence that they can swim on their own. Did we mention that our young swimmers love it when we put the Endless Pool on “warp speed”? Turning on the Endless Pool currents provides resistance that slows the kids down, forcing them to swim for a longer time to get across the pool. Four strokes to get across can turn into 20+ strokes to get across. The result? More repetitions and a focused practice. Mirrors on the bottom of the pool provide real-time visual feedback to swimmers to remind them of key points. Rather than telling them to “look down,” a coach can tell the swimmer to “look for two pink goggles” staring back up at them in the mirror. Coaches can stay to the side or front of the swimmer easily and adjust the strokes and body position because the swimmer is moving more slowly or staying in place. The current resistance forces swimmers to hold their form together better than in a still-water pool. The currents provide more feedback on body position, breathing and wasted motion because mistakes become more noticeable to your speed and progress. We’ve had case after case of adults telling us they’ve tried for years to cut their tri split times or improve their efficiency in the water. While many made minimal gains, they didn’t see substantial improvements until they came to our Swim Studio. Our Endless Pool setup allows you to see video feedback immediately after every exercise. Under- and above-water video cameras provide swimmers with 360-degrees of video-taping. “Delayed playback” video features allow swimmers to see exactly what they did after EVERY swim, rather than just the ones we record. 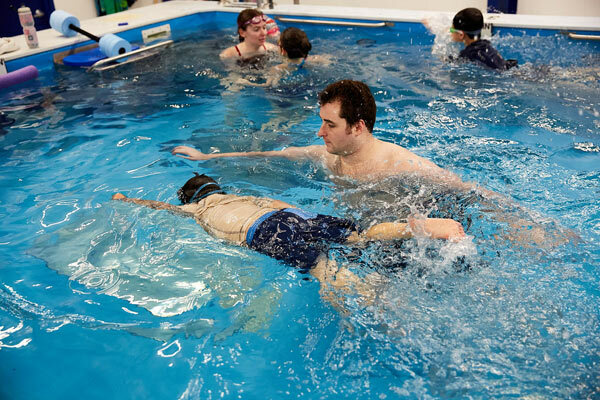 Our coaches teach from the water and stay right beside your swimmer as they swim in place against the current. If your swimmer is falling back into old habits, our coaches can make adjustments in the moment, rather than waiting until the end of the length or the end of the repeat. Drag and wasted motion has a higher cost in swimming than it does in other sports. By forcing swimmers to cut through a current, they get greater feedback on eliminating wasted motion than they ever could in a still-water pool. Swimmers can get unbelievable feedback on their speed and efficiency. Because the current speed is fixed, they know “in their bones” whether a change has improved their stroke and speed. A truism we’ve discovered in the last 15 years is that human beings always take too many strokes to go a given speed. Scenario 1: If the stroke is smoother and easier and the speed is the same, they know that they increased their efficiency. Scenario 2: If they can swim at the same tempo but go faster, they know that they have improved their speed. If they can swim at the same speed but with fewer strokes and slower tempo, they have become more effective. Scenario 3: Adjust speed using micro-changes to tempo using a Tempo Trainer (“a pool metronome”). We can use this exercise to communicate that swimming fast isn’t about swimming hard, but rather, it’s about maintaining stroke length while making planned adjustments for a faster cadence. Swimmers can watch their strokes in real-time as they practice using mirrors and video cameras. 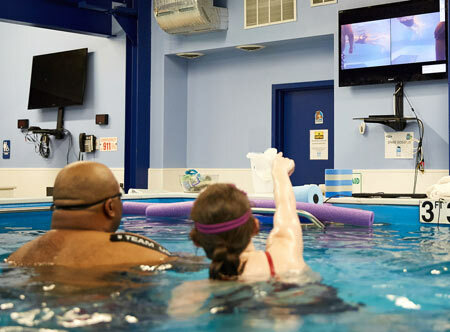 One of our favorite breaststroke improvement activities is putting a camera on the back of the pool and having the swimmers watch their kick on the television. By watching every kick as they do it, they can spot inefficiencies and link the visual feedback to the feel of the kick changes. Our resistance pools allow for short, perfect swims and then long test swims. A favorite activity with butterfliers is to challenge them to do quick repeats of short swims of 5 strokes with the video to get a feel of the change and then have them go for 20 or more strokes to see where their form degrades. The feedback can be huge for 100 and 200 fliers. The next time you walk through the Swim Studio, we hope you smile to yourself in knowing you’ve chosen the best swim school in Chicago. Our Endless Pools are not just two small, square pools. In reality, they’re a secret weapon!